Wixom’s Nordson Corp., a supplier of precision technologies for ambient temperature material dispensing, today announced the launch of an automated cartridge dispensing system called the JetStream. The robot-mounted product is ideal for the application of aircraft pre-mixed sealant materials in assembly operations such as wing spar, panel, fuselage or aircraft door sealing. The product can also be applied to processes such as A-dimension covering, fastener doming, or small beads for joint sealing. 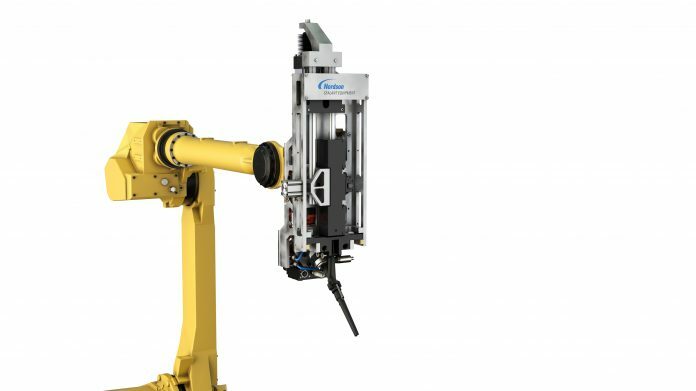 The JetStream reduces process times through the robotic application of accurately metered material and automates a manual process, increasing production first-pass quality and reducing material costs and unnecessary structure weight. The system was designed specifically for sealant dispensing applications in aerospace manufacturing. It features an articulating cartridge holder that opens to load and unload pre-mixed cartridges. Its built-in volumetric dispense valve assembly eliminates material supply hoses and increases the accuracy of bead, volume, and placement. The JetStream also has three interchangeable applicator designs: the brush applicator, and two types of sealant applicators. It monitors material level, temperature, time, pressure, and valve positions. Changeover from a used cartridge to a new cartridge can be completed in seconds. The JetStream enhances the company’s existing product line of aerospace manufacturing and assembly solutions from its sealant equipment portfolio. Nordson supports processes including specialist aerospace adhesive and sealant manufacturing, composite part edge sealing, and mix-on-demand dispensing.